Design retailer nova68 has managed to find new old stock of the classic Braun travel alarm clocks. A limited supply is available, Braun ceased production of these clocks many years ago and these are now getting rare collectible pieces. Dietrich Lubs and Dieter Rams: Braun AB1 Travel Clock Alarm. The ultimate style icon! This iconic travel alarm clock was designed in 1971 and updated in 1987. 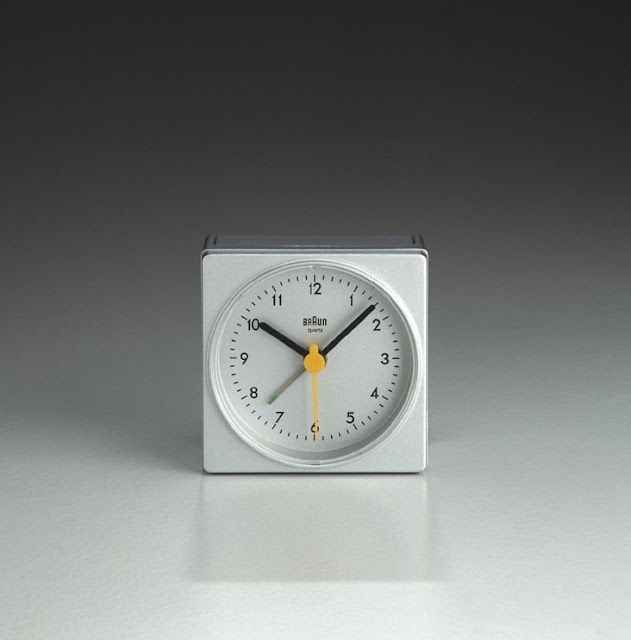 Dietrich Lubs designed this now iconic clock for Braun, while Dieter Rams was Head of Design for the company. This super compact Braun alarm clock is the perfect travel alarm clock since it stands only 2.5" tall. While primarily used as a travel clock, this clock also works very nicely on the desk. The Braun AB1 Quartz travel alarm clock features an interval alarm signal and a quiet quartz mechanism. The alarm switch is large and easily operated. One AA battery will last over one year (not included). Braun was one of the world's most commercially successful design firms in the post-war years through to the end of the 1980's. Born out of a garage in 1921, Braun made radio parts and diversified using rapidly developing technology. With an impressive design team including Dieter Rams (German, born 1932) and Dietrich Lubs (German, born 1938), Braun's reputation as a maker of innovative small appliances sky-rocketed: electric shavers, hair dryers, travel alarm clocks, digital watches, pocket calculators, stereo equipment. However with Braun's acquisition by Gillette and subsequently by Proctor & Gamble, the once prevalent line of Rams and Lubs products became obsolete in 2005 as Braun focused on shaving tools. The AB1 clock, shown here, a long-lived design, is a reliable, user-friendly, ever popular alarm clock.